The highlight of Caitlin Comfort's final cross country season at the University of Wisconsin was her second-place finish at the 2011 Big Ten championship at Urbana. The 2008 Peoria Notre Dame graduate finished the 6-kilometer course in 20:12, behind only Caitlin Lane of Penn State (19:58). Comfort went on to place third in her NCAA regional and 119th in the NCAA championship. For a quarter of a century Walter Grebe was Mr. Football at Farmington High School. Starting in 1937 through the 1961 season, Grebe was one of the state's most successful football coaches at one time producing four unbeaten teams and losing only two games in a six season period. 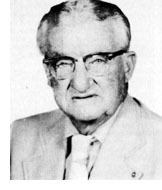 A graduate of Western Illinois University, Grebe coached all sports at Farmington High from 1937 until the early 1950s. He coached basketball for 18 seasons, track and field for 10 and was baseball coach for 30 years. The Farmington High baseball diamond is named in his honor. Compiling a career record of 149-68-14, Grebe put together his most powerful football teams beginning in 1945 when the Farmers went 8-0-1. He was unbeaten in 10 games the following year, lost just one game in 1947 and 1948 and produced unbeaten teams in 1949 and 1950 for a six season record of 53-2-2. His teams won 10 lllio Conference titles, had five unbeaten conference seasons, never finished below second place and at one time won 27 consecutive conference games. A Paul Harris Fellow, Grebe is a member of the Western Illinois University Hall of Fame, where he was a 140-pound quarterback, and the Illinois High School Football Coaches Hall of Fame.